As college costs continue to increase, more and more Americans rely on federal student financial assistance programs to help pay for their postsecondary education. Despite the demonstrable and continually increasing importance of federal student aid, the majority of Americans have little knowledge of the Title IV programs or the processes necessary to apply for these funds. Meanwhile, members of Congress have been debating the best ways to reform and strengthen the federal aid programs. It is important that Congress and the general public understand these programs and the students they serve. 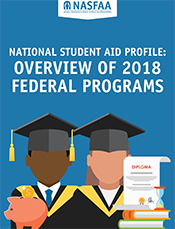 In an effort to increase knowledge of these vital programs, NASFAA provides the National Student Aid Profile, updated annually. In 2018, NASFAA added two new sets of data to the National Profile. The first is from the Office of Federal Student Aid’s "FSA Data Center" and includes data on repayment status, loan status, delinquency status, and the Public Service Loan Forgiveness (PSLF) program. The second is the 2015-2016 National Postsecondary Student Aid Study (NPSAS:16), released by the National Center for Education Statistics (NCES). In addition, we provide an appropriations update on Title IV program funding for the 2018-2019 award year. A description of the federal student aid application process.